Here’s the entry I didn’t think I would ever do. And then once I saw the movie and spotted famous designs, I spent as much time as possible avoiding writing this entry. But, I can’t deny that the Cullen’s house in Twilight is rather magnificent. And Edward’s room, in particular, caught my eye. The house used as the Cullen’s home was designed by architect Jeff Kovel and is actually the Hoke Residence (2007) in Portland, Oregon. But I think Christopher Brown (who has also worked on Mad Men) and Ian Phillips, the movie’s art directors and Gene Serdena, the movie’s set decorator, are to be credited with designing Edward Cullen’s cultured bedroom. Remember, Edward Cullen is 109 years old, so if anyone would know good design …I’m just saying he’s had time to work out the kinks in his personal style. As everyone knows, vampires don’t sleep. But who am I to question their necessity of a daybed, especially when it is the iconic daybed designed by Ludwig Mies van der Rohe. This classic piece of furniture has an interesting background. In 1929, Mies van der Rohe designed the German Pavilion for the International Exposition of that same year in Barcelona, Spain. It was for this pavilion that he designed chairs and stools, creating the Barcelona collection. The accompaning daybed/couch was designed in 1930 for use in Philip Johnson’s apartment at 424 East 52nd Street, New York overlooking the Museum of Modern Art’s garden. And it was not until 1931, at the Berlin Bau-Austellung, or the German Building Exhibition, in Berlin, Germany that this piece of furniture was seen by the public. Featured in an exhibit called “The Dwelling of Our Time,” the couch was featured in Mies van der Rohe’s Apartment for a Bachelor. The daybed has also been photographed in The Farnsworth House (1945-1951) in Plano, Illinois and Philip Johnson’s Glass House (1949) in New Canaan, Connecticut. 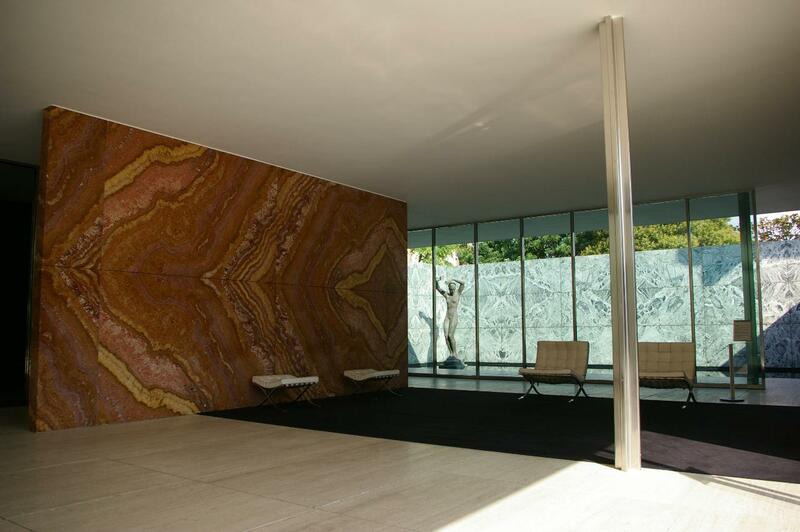 Mies van der Rohe sold the design to Knoll in 1953 and it is still made by that company today. Other famous furniture in Edward Cullen’s room includes his desk chair. It is an Eames Molded Plywood Dining Chair, or in his case, a desk chair. Charles and Ray Eames designed this ergonomical chair in 1946, making it a fairly ironic chair for a vampire to use. It’s not like he’s going to have a stiff back or sore shoulders, is it? It has been sold since 1946, as it is sold now, by Herman Miller. This influential design couple met when they were both adult students at Cranbrook Academy of Art in Bloomfield Hills, Michigan in 1940. By 1942 they had moved to Los Angeles California and went on to design furniture, architecture and create films together. They were both proponents of modern design and major influences on Modern Architecture. According to the Herman Miller website, in 1999, the Eames Molded Plywood Chair was named by Time Magazine to be The Best Design of the 20th Century. They playfully mention that the locomotive came in second. It is interesting to note that in the early 1940s, Charles Eames was a set architect for MGM Studios. And he is noted, by the Design Museum, as having worked on Mrs. Miniver. Edward Cullen’s room, while, I would venture to say, is nothing like a regular teenage boy’s room, it may be our first glimpse of an average vampire posing-as-a-teenager-but-who-in-reality-is-over-a-century-old’s room. Minimalist in decoration, a little messy and filled with icons of design he’s collected over the years. This might just have made me want to watch the film about vampires…I don’t believe it?! All of this furniture you have in your blog today I have seen in homes and offices many times in the 50’s. It was very plain from what we had seen before that but very comfortable. For starters, your writing is first rate. My only knowledge of interiors and furniture stems from day trips with you to places like “House for an Art Lover” and LeCorbusier’s “Villa Savoye.” Just as your knowledge dazzled me with the subject right before my eyes, I find myself enamored with your descriptions of sets on which I’ve never even laid eyes. The Herman Miller Eames lounge chair is the epitome of the modern mid century design to me, and I’d assume that others agree with me. I love the clean and aesthetically pleasing design that it offers, as well as the immense comfort. Eames is the epitome of a perfect lounger. UBD, enjoyed your article; found it in the course of a desperate search to identify the artist of the painting on the hallway entrance to the Cullen house in the first Twilight movie. Strangely, I can find no mention of the artist (although plenty of questions as to who he/she might be) anywhere! I am referring to the abstract landscape in dramatic greens and blues that you see on the stairway wall as Bella and Edward enter the house. Can you or any of your readers help me out and identify the artist? Did you ever find out the artist for the painting above the stairs from the first Twilight film in the Cullins house? Please help!! I’ve looked everywhere but haven’t found out who the artist is yet. I haven’t forgotten and will keep an eye out! Thanks, R Whaley! I think you’ve found it! It’s funny, because I came across this artist when I was searching too, but was never able to find an exact match. Nice work. It’s mentioned at this website because there is also a Santos doll in the still: they are dolls from the 17th century made by priests. …I learned two new things today! The painting in The Cullen house is not by Marina Dejanovic,the painting you saw on art break is Marina’s inspired painting from the one in the Cullen house.She does not know who the artist is that painted the one in the Cullen house.The one that you see on art break ,pin interest is Marina’s painting but it certainly is not the same one in the Cullen house.Marina has the painting but it is not for sale …not unless she changes her mind again.There are no prints from her painting either so as to the artist that painted the one in the Cullen house well that is still a mystery.I did however tell Marina that her painting was very interesting and i love it even though it is not the real one from the Cullen house. Lethe ….you are exactly right it is not the same painting and Marina does not mention it as its not her work ,it is a inspired painting taken from the one in the film and that is why she has not taken credit for it. I write a blog about design and have a secret Twilight obsession. The Brazilian beach house featured in the not yet released Breaking Dawn movie was also shown in Architectural Digest. see?!! Not all things Twilight are cheesy. Your blog is wonderful – I had a great time visiting tonight. Since you solved the other Twilight art mystery perhaps you can solve this one. Who painted the two watercolor portraits that hang in the Cullens kitchen. You see them briefly when Edward is introducing Belle for the first time to his family. They are primarily black and white. One is of a woman’s face the other of a woman with a hat.